Invite single men who are interested in learning more about our way of life. This is an invitation only event. Please contact Fr. Colm to arrange an invite. The Augustinians are religious priests and brothers following in the footsteps of Christ and Saint Augustine since 1244. We are "Active Contemplatives." We are Men of Heart. We serve God and His people in diverse ministries as priests, educators, and missionaries. The order is a brotherhood within the Catholic Church, so you need to be a Catholic to join. Brotherhood? What if I'm a woman? There are Augustinian Sisters - a number spread around the world. As well, many congregations of Sisters follow the Rule of Augustine. Women can also be associated with the Order through our Augustinian lay groups. But basically to join the Augustinians you need to be male, a person of faith and looking for your way of living that faith in a religious community. To become an Augustinian assumes a certain faith commitment. That doesn't mean being overly churchy: it means being a person with a commitment to their faith. As a member of the Order you will be a professed brother. You may wish also to be a priest, but that's another choice to be made and involves further study and training. One of my earliest memories is of my two brothers and myself ‘saying mass’ when we were younger in the upstairs of my father’s pub. In fact, thinking back many of my memories revolve around such things as attending Mass, going to altar-boy practice or participating in the local novena. If this makes me sound devoutly religious I am anything but, the point is that I had a normal Irish childhood and many reading this will have similar memories. Obviously, at such an early age I had little intention of entering Religious life, but this changed when I entered Secondary School, and a returning missionary showed us a presentation on leprosy in Ethiopia. This deeply touched me, and I remember fundraising for the Brother, and my Religion teacher saying that she would be proud if I became a Priest/brother. Perhaps she saw something I didn’t? At that time I remember thinking the life of a religious was very daring and exciting while helping the poorest in our world and society. I still think this is part of my vocational calling today! However, it wasn't until I was about 16 that I seriously considered the idea of Priesthood and I remember sending off a letter requesting information around that time to my diocesan vocations director. Whether or not it was received, I don't know, but the fact that I never heard anything back made me think that I wasn’t good enough to be considered and the thought evaporated from my head for some time. And so life continued, and I did all the things that a young man does. I had girlfriends, I went out socialising with friends and played a huge variety of sports, with hurling as my first love! I had various jobs while I attended university, and I finally qualified as a secondary school teacher, working my way to be a Deputy Headteacher. I loved teaching and those years were undoubtedly the most enjoyable of my life. I still miss the interaction with the pupils to this very day, and I do hope that I might one day work in one of our Augustinian schools here in Ireland. During my long school holidays, I volunteered with the Missionaries of Charity in India, Ethiopia, Romania, London and Albania and those experiences were hugely influential in my vocation to Augustinian religious life. As a volunteer, I was encouraged to participate in the life of the ‘Sisters’, and I thoroughly enjoyed their rhythm of life. In fact, this rhythm of life is similar to our Augustinian communities with an emphasis on prayer, ministry, silence and contemplation. Maybe that’s why we are sometimes referred to as Active Contemplatives? Even though I had a successful teaching career and all the outward signs of fulfilment, I was always seeking something more profound, and I found this when I prayed and spent time in silence with God. And this led me to the Augustinians. You see, the essential Augustinian charism of coming together as a community “one in mind and heart” is very appealing to me, and something I feel that I contribute positively towards. 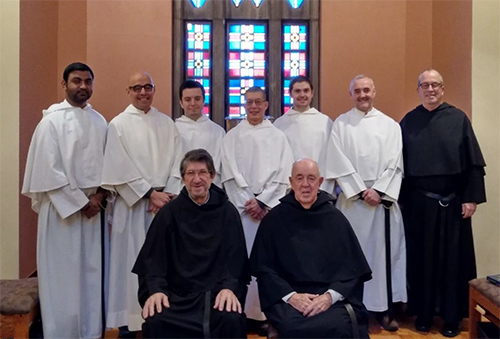 I desire to serve God in many forms; from serving his poor in whatever way poverty manifests itself – physical, spiritual, material, financial etc., celebrating the sacraments, studying or just merely being present in community with my brother friars. I believe I am making a difference however small that may be. Contrary to what many people think, living as an Augustinian does not mean sacrificing everything that I know or believe in. In fact, I experience a great sense of freedom living the life I know God wants me to live, and I know our Order actively tries to make sure that each Friar is living their true vocational calling. I can honestly say that I feel entirely at home in our Augustinian communities, and I simply can't imagine not being an Augustinian now. Good luck in your discernment, and if you are open, God will grace you with all the answers you require. Receiving my referee certificate recently at Croke Park takes me back to when I was 18 and the first time I refereed a game of hurling. I’ll not ruin the surprise of how many years ago that was now (a clue…the cast of Derry Girls were probably not even born), the point being that it shows how long I have been interested in refereeing and now I am finally able to do so in the Dublin area. Bro. 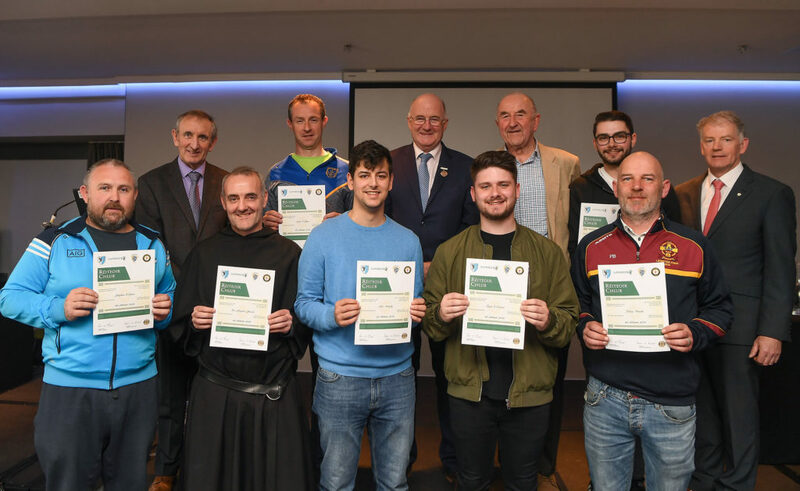 Stephen and other referees receiving a certificate from the GAA President, Mr John Hogan, for successful completion of a GAA Adult Referee Course. You hear scare stories all the time of the abuse that referees receive, and no doubt there is an element of truth about them. However, little is mentioned of the extreme satisfaction one gets after a job well down (even if both sets of supporters don’t necessarily agree), and the commitment to make sure the mistakes of the last game aren’t repeated in the next one. Maybe this is a metaphor for life? You’ll not see me in Croke Park anytime soon as I plough my furrow in the lower leagues, but that doesn’t matter. What does matter is that I am following a passion I have had for many years, and I thank my Community and my Province for this opportunity. Of course, I especially thank God because if the scare stories are true, then I may well need Him on my side! So do I need to be anyone special? Fr. 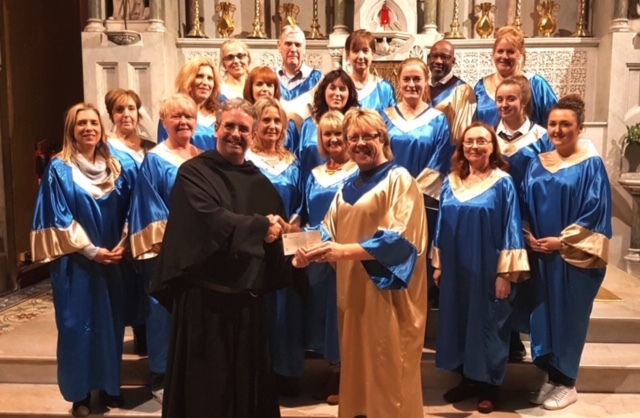 Colm with The Augustinian Gospel Choir, Drogheda.